Now that regular HDTV is firmly entrenched in the marketplace, with hardly anyone left who depends on an old cathode ray-equipped standard definition TV, of course something newer and better is just around the corner. This next generation in high definition television technology is starting to make inroads in the minds of early adopter consumers. Some TVs branded as Ultra HD are actually available for purchase today. But will your existing BluRay content or HD television service support the higher resolutions? Late in 2012, the trade group known as the Consumer Electronics Association (CEA) announced that the term “Ultra HD” would apply to televisions with an aspect ratio of 16:9 and a resolution capability of at least 3840 x 2160 pixels. There are two different Ultra HD resolutions. 4K offers a resolution of 2160p, while 8K provides 4320p resolution; in comparison, today’s full HD resolution is 1080p. These two new resolutions feature four times and 16 times as many pixels, respectively, as regular 1080p HD. According to the CEA article, Mike Lucas, Senior Vice President of Sony Electronics Home Division, expects that satellite providers will begin rolling out 4K broadcasts over the next two years. His own company released an Ultra HD BluRay player and television in 2012. The new generation of Ultra HD sets — LG and Samsung — also have models on the market that are capable of up-converting regular HD into the new video formats. Should You Upgrade to Ultra HD or Wait? 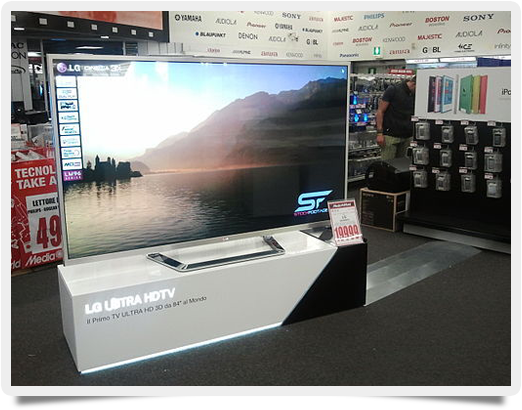 If you need to have the latest and greatest in technology and your bank account can afford it, by all means check out the newer models of Ultra HDTV technology. While you’re waiting for content providers to support the new resolutions, you can expect picture-in-picture capabilities to be much clearer on these new TVs. It’s also safe to assume the size of televisions will increase, with TVs over 50 inches becoming the standard. With 3D TV not really taking off, maybe Ultra HD will be more of a success in the marketplace.